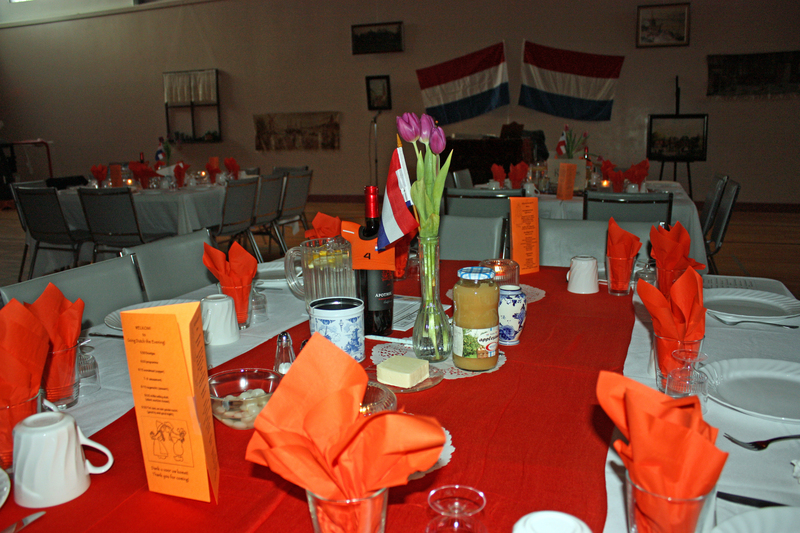 By crazy random happenstance or providence, the annual Adult Supper fundraiser for the youth service projects at my church had a Dutch theme this year. In the past the themes have been wide ranging from the 60s or 80s to superheroes and TV shows. The evening often involves costumes, food, games, and a little wine. While my Christian Reformed Church community in Edmonton has a strong Dutch heritage, not everyone is from a Dutch background, my British-Canadian husband being case in point. Through marriage, other new members and time, there is a weakening of the Dutchness of our church, it is certainly less than when I was a child. Last fall we had a dinner celebrating cultures around the world with food from countries such as Kenya, India, and Honduras where our members have volunteered in community development, disaster response, and advocacy. Despite the growing diversity, there is still a flavour of Holland running through the community and this year’s adult supper was a light-hearted celebration of our history. When I learned this project would be so fortuitously themed, I couldn’t miss it—not only as an opportunity to tell my community about my research project with a short post dinner spiel, but also to live a little Dutch culture through the eyes of an immigrant community. So what does a Dutch night in Canada entail? 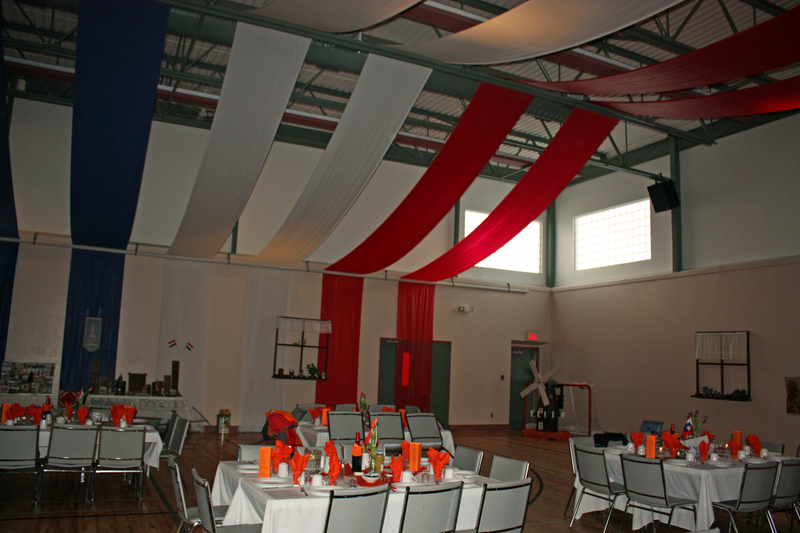 The ceiling is draped in the colours of the flag: red, orange, and blue. 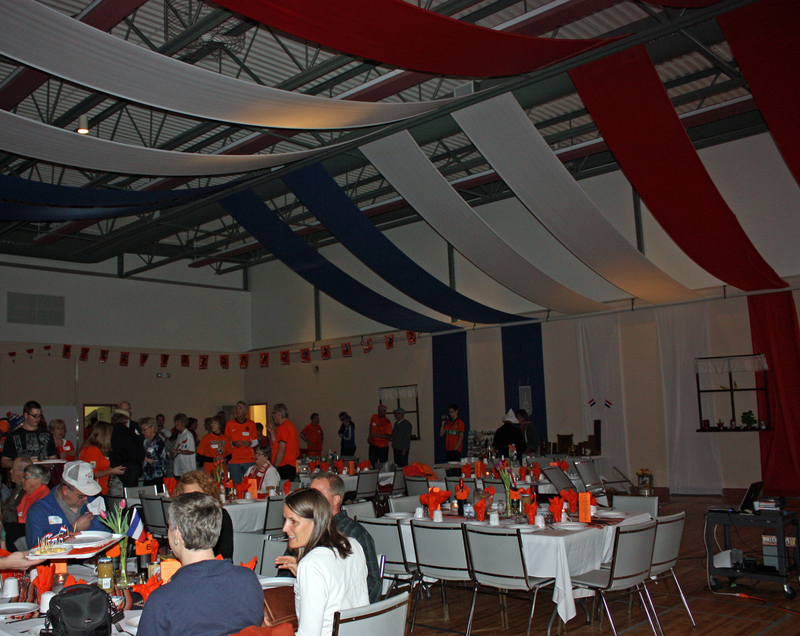 The room is a sea of orange on the tables and on the people, many wearing Dutch voetbal (soccer) jerseys. While orange doesn’t appear on the flag, it is the colour of the Dutch royal family and national pride. There are a few people in traditional costumes and the clomping of klompen (wooden shoes). My dad is there sporting his hat, suspenders, and klompen—the wooden shoes don’t last all evening because they really are hard—but for now, Edgar Wierstra looks like a proper Dutch farmer. 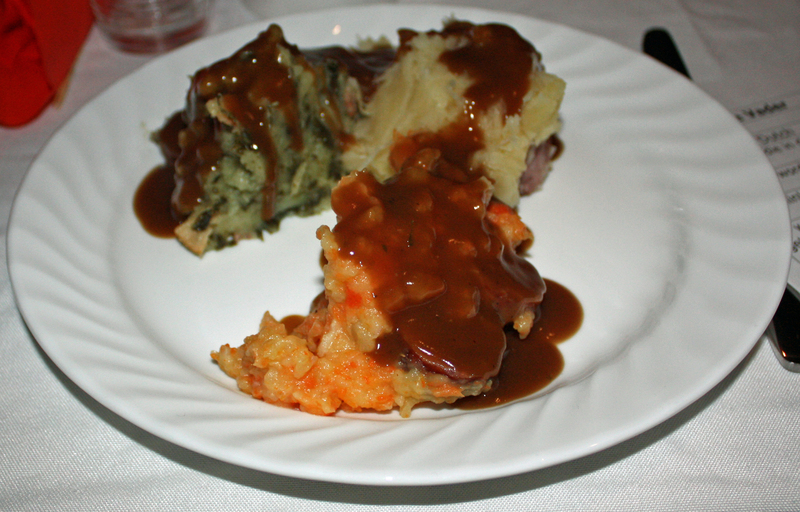 Dinner is a trifecta of stamppot (any vegetable mashed with potatoes) including boerenkool (kale), hutspot (carrots), and zuurkool (sauerkraut) with sausage and gravy. The koffie is served with a dollop of whipping cream, the rumour of which sends my English husband to hang around the kitchen. Each table has a variety of droppies (strong, salted licorice candies) that you must be grow up eating or you think it is vile stuff. My husband can even look at them, but by the end of the evening, most of our droppies are gone. The two bottles of wine on the table are dressed in orange jerseys. For our entertainment we listen to Dutch songs, play full contact Dutch Blitz (normally a card game), and dance the chicken dance (Dutch? I wonder). Our MCs speak in both English and Dutch. You could tell where the pockets of Dutch speakers in the rooms are because they would laugh before the translation. It’s time for dessert and I am called up to the front to represent my table in an eating contest. With my recent foray into Chinese cuisine and eating caterpillars and bullfrog, I am the brave choice. I know I can eat whatever they put in front of me, but hoping I can miss the inevitable pickled herring. Someone puts a bottle of wine in front of me and I hesitate, briefly, then pick it up and, desperate, I take a swig so I can finally swallow. The room roars with laughter and I hear someone shout, “Put that on your website!” I shove another rusk in, and finally choke it down. I want to swig the wine again, but figure it’s probably not decent to do it again. Then they take pity on us and I take the win for getting the most down and the final rusk is thankfully left uneaten. I return to the table and drink every liquid in reach. Our table gets a layered pastry and cream dessert, while my poor competitor has to try again. At one point in the evening, I was joined by a woman with an offer for an easy recipe for kroketten. “I would love that!” I told her. It’s one of my favorite dishes (I think it’s everyone’s favorite) but I never make it. I always buy it from the local Dutch market. We start with a little Dutch bingo, pin pointing common Dutch acquaintances and friends. She knows my parents, I know her younger brothers, and several cousins. Our families have connections that go back decades. Satisfied we return to the topic of our common heritage. “I wonder what actual Dutch people would think of this evening,” I ask her. We laugh because we realize that this evening is a bit cheesy, a little quaint. She tells me that even the Dutch the MC is speaking is old fashioned. I nod and compare it to my mom’s Dutch. My mom has told me her version of Dutch is stuck in 1950s when she left and there a many newer words, phrases, and changes that she doesn’t know. We decide this evening is likely more of a faded snapshot of the memories of mid-century Dutch immigrants rather than a modern portrayal—but it doesn’t matter, that snapshot is the Dutch culture that most of us grew up with.